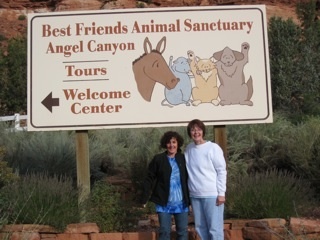 My journey to the Best Friends Animal Sanctuary at Angel Canyon near Kanab, Utah began long before my recent visit there to volunteer, and before I even knew about Best Friends. It started a few years ago with Maggie May. My husband and I spotted Maggie May from a distance, watching the beautiful but thin Pointer walking slowly toward us, tail wagging, greeting us in such a friendly and inviting way. I was horrified as she looked up at me, and revealed a gaping neck wound which would require 35 stitches. She was also pregnant. It appeared someone had slit her throat and left her to die. I was again horrified when a sheriff’s deputy informed me that there was no local animal control service in that county and under the circumstances we should just “ finish her off”. I cried. My husband held her gently in his lap until we reached the emergency clinic. We named her Maggie May. Under the watchful eye of a caring vet and a loving foster family, she healed from her wounds and weeks later this delightful girl was adopted into a new home. Then came Jack, my sweet Border Collie, shot in the face and rescued from a shelter before he was to be euthanized. How many people with similar stories become involved in animal rescue? On my recent visit to Best Friends Animal Sanctuary I got a pretty good idea. Best Friends Animal Society, founded in 1984, is perhaps one of the best known animal rescue and advocacy organizations in the country. 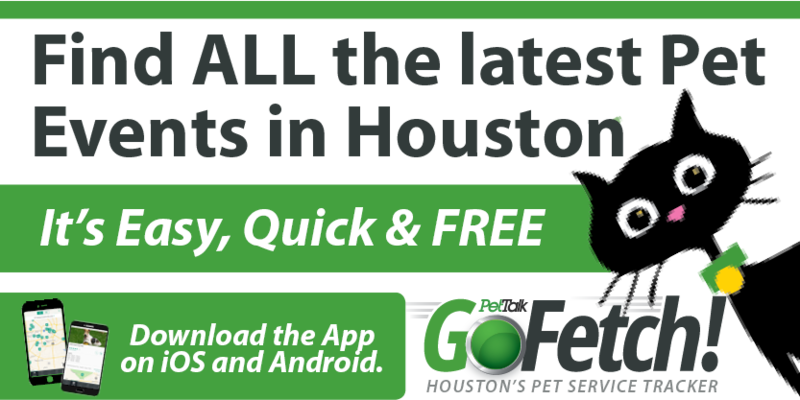 Best Friends networks with shelters, rescue groups and animal welfare organizations nationwide offering services and working cooperatively to end the killing of homeless animals. Best Friends was instrumental in the rescue and care of thousands of animals displaced by Hurricane Katrina, is known for it’s rehabilitative work with 22 of Michael Vick’s dogs now known as the Vicktory dogs, and its international efforts assisting local rescue groups after natural disasters in Peru, Mexico and more recently Haiti. 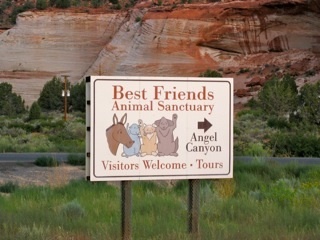 Located in southern Utah, Best Friends also operates the largest no kill animal sanctuary in the country. “DogTown”, the National Geographic Channel television series which chronicled Best Friends work with abused and neglected dogs is located at the Sanctuary. 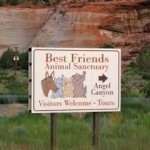 Best Friends Animal Sanctuary is spread out on 3700 acres among the beautiful red rocks of southern Utah. Most of the 1800 or so animals living here are cats and dogs, the rest include parrots, horses, pigs and rabbits with each animal living in their respective “town”, Cat World, DogTown, Piggy Paradise, Horse Haven, Parrot Garden and Bunny House. The residents of Best Friends come mostly from shelters in other parts of the country, and from places where limited or no resources put them in jeopardy of being destroyed. Each animal’s needs are addressed individually with the ultimate goal of a new forever home. For some, the Sanctuary becomes their forever home because of the trauma from abuse or neglect, or medical issues or old age. 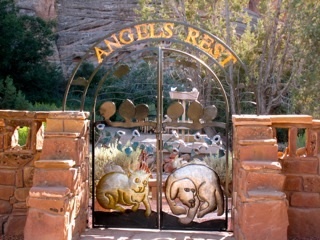 When animals who live at the Sanctuary pass over the Rainbow Bridge, they are memorialized at Angel’s Rest, a quiet, peaceful final resting place. From my first steps into the Welcome Center to the last hugs as I left, Best Friends guiding philosophy of a better world through kindness seemed to resonate throughout the Sanctuary. Each year thousands of visitors (32,000+ in 2009) tour the Sanctuary situated in the heart of the Golden Circle of national parks and monuments. Many come to volunteer (8400+ in 2009), some year after year. With such high standards of care and so many animals to care for, volunteers are an integral part of the daily lives of the animals at Best Friends. Each volunteer experience is individualized based on interest and needs. An application to volunteer is required and can be completed online. Staff helps identify and coordinate activities and ensure the overall success of the experience. It is easy to understand why so many volunteers return. Thrilled, yes I was thrilled to be volunteering in DogTown! At Best Friends with my best friend Anna, also a dog lover and nuts about anything that has to do with dogs! 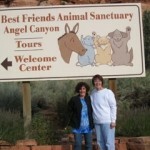 The first day we toured the Sanctuary, attended a volunteer orientation and a safety inservice. At the orientation our coordinator reviewed our schedule and discussed the opportunities available to us to work with the dogs plus other educational and social activities which we were invited to attend. The safety inservice outlined their guidelines for working safely at the kennels around the dogs. After that each day began at DogTown Headquarters. At DogTown the day is divided into a morning and an afternoon session for the volunteers. Volunteers can sign up for one session or both. They can assist caregivers in any number of ways from cleaning kennels and runs, preparing meals, bathing and grooming puppies, participating in puppy socialization and shy dog classes, playing and socializing with the adult or senior dogs or walking them along the surrounding trails, and that’s not all. Volunteers can also take a dog on outings outside of the Sanctuary or overnight. Our plan was to experience it all and that we did! At the end of each day we were dirty and tired but exhilarated as we drove across DogTown to pick up Safari. We met Safari soon after we arrived in DogTown and fell in love with this gentle, sweet 10 month old. She was the one we would take overnight. Safari came from a litter of eight, raised at DogTown and was available for adoption. Our job was to help in her socialization outside of the Sanctuary. What we discovered during our three nights with her, was a well balanced, well socialized dog, a shining example of what Best Friends is all about. We kept wondering why hadn’t this lovely pup been adopted and later found out two adoption applications had fallen through for one reason or another. No fault of Safari. We knew Best Friends would continue to work hard to find her a forever home. 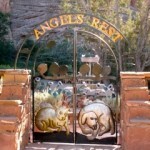 A video of Safari can be viewed on the Best Friends website at www.bestfriends.org. Leaving Best Friends Animal Sanctuary was bittersweet. It was nice to be in a place where everyone eagerly shared photos of beloved pets back home and stories of animal rescues. New found friends and connections among other volunteers sharing the same passion and love for the animals. Best Friends was like a retreat. We left feeling energized, savoring the experience, focused on what we had learned and could share back home. Yes, in the end it was quite clear why so many volunteers return. Oh Linda, what a wonderful story. I could hardly finish the second half of your article because of the tears in my eyes. Thank you.